This is a new class running on Thursdays @ 12pm starting this Thursday June 1! Are you always sore & stiff? Are you losing your flexibility & mobility? Join us for a therapeutic practice that uses intentional movement & targets specific areas in your body to help you decrease muscle tension & increase mobility. Learn more about what happens to our muscles & tissues as we age & what we can do to be preventative and also improve flexibility. We will also be using therapeutic grade essential oils that are approved by Health Canada and are used specifically for muscle tension, strains and rheumatoid arthritis. Join us & discover why this is such a popular practice! Sunday Gentle Flow at 10am will continue in June. Please let us know if you would like it to continue through July & August as we will cancel it through the summer if there is not enough interest in it. This is the last 4 weeks before Jess is off for the summer. What oils resonate with you? What colours are you drawn to? What part of your body do you hold the most tension? These are all great questions to guide you toward what bracelet would best support you. You choose your bracelet, your colours, your chakra & your oil. 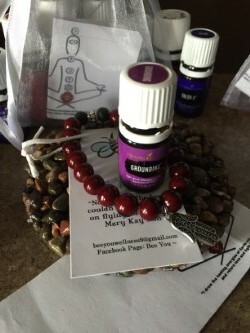 These bracelets also have lava beads which are used for essential oils so once you choose your oil you will receive that oil sample that can be used numerous times with your bracelet.